Also know as Moldava. This favourite hangout for the sun loving Czechs was the subject of one of Smetana’s best-loved compositions which everyone will know as “The Vltava”. You can also visit Smetana Museum on the river side. It is a relatively pollution- free river which flows from the Southern border of the Czech Republic, near Sumava Mountains through Prague to the Northern border. After Moldava river joins Elba river and flows into the North Sea, in Hamburg. The river runs through many of the countries small historical towns and is broken at various points by dams. Canoeing and sailing not to mention picnics and bathing are very popular during the summer and fishermen in their boats can be seen almost all times of the year in reasonable temperatures. 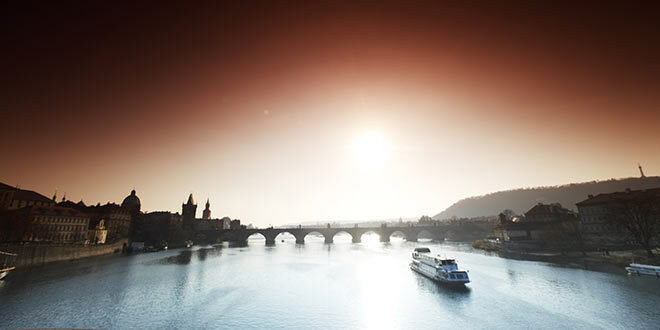 For the visitor to Prague the river might be a way to view many of the best parts of a town at leisure. Boat trips night and day regularly wind their way up to as far as Vysehrad castle and back offering music, drinks and meals along the way. During the summer a boat on weekends will take you for a day trip as far as the Slapy Dam 20km south of Prague. Tip: Experience accommodation on the boat – water hotels are called botels. Do not worry, you will not wake up in a different place the morning after – the boat does not have engines. However the botels offer an original way to overnight in Prague. The botel in Prague are Racek Admiral, Albatros-and Vodnik. The 1000-year Flood Hit Prague in 2002. The usually calm Vltava can present another fiercer face, as in 1890, when its waters rose and swept away three arches of Charles Bridge. But the worst-ever flood came in August 2002, when whole districts of the city were under water, thousands of people had to be evacuated from their homes, including some large animals from the local Zoo, and billions of crowns of damage were caused.